Jesus changed people's lives by offering an unlimited welcome to everyone he met. Many of the people Jesus met were like the men and women who live on the streets in DC or any other city. In the way of Jesus you can also change a life this winter by donating a coat or a pair of boots to our homeless neighbors in Franklin Park by supporting our Annual Warming the Homeless: Coat and Boots mission. 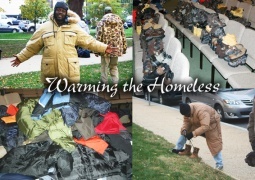 An annual mission of Crossroads is our Warming the Homeless, "Coats and Boots" mission. Each November we off the opportunity to get involved by donating new boots sizes 10-13 (we will need a few 14 -15) as well as jackets/parkas (90% men apparel) in LG through XXXLG. You can also make a monetary donation to Crossroads marked "Warming the Homeless" during worship on Sunday or on our webpage. All donations are tax deductible. Sign up to help by sorting the coats and boots on November 2nd or being part of the delivery on November 4.